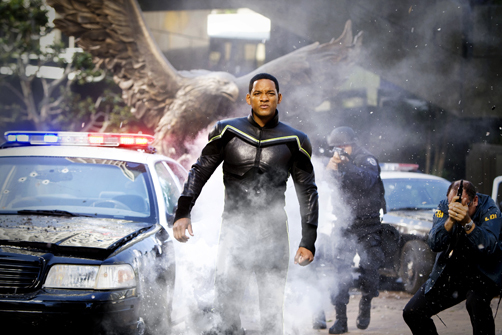 SYNOPSIS: There are heroes... there are superheroes... and then there's Hancock (Will Smith). With great power comes great responsibility -- everyone knows that -- everyone, that is, but Hancock. Edgy, conflicted, sarcastic, and misunderstood, Hancock's well-intentioned heroics might get the job done and save countless lives, but always seem to leave jaw-dropping damage in their wake. The public has finally had enough -- as grateful as they are to have their local hero, the good citizens of Los Angeles are wondering what they ever did to deserve this guy. Hancock isn't the kind of man who cares what other people think -- until the day that he saves the life of PR executive Ray Embrey (Jason Bateman), and the sardonic superhero begins to realize that he may have a vulnerable side after all. Facing that will be Hancock's greatest challenge yet -- and a task that may prove impossible as Ray's wife, Mary (Charlize Theron), insists that he's a lost cause. REVIEW: What a great idea! Sounds like a really cool story. The previews are amazing. The cast looks like a lot of fun. The special effects are out of this world. Hancock has got nothing to envy Superman. All these thoughts ran through my mind before actually seeing the film. It started pretty good. It was captivating and funny with decent action and special effects. The story was moving along nicely too, until it hit some sharp turns and speed bumps which took it to the realm of “huh?”. Some of the twists were pretty cool, but some of them were not. What a shame because it was going so well. It seems like they tried to spice up the plot but they ended up over complicating it when it would have been better off being just plain, simple, and straightforward. Superhero movie storylines do not need to be overly elaborate, the action and special effects, though, do. In this case, practically every aspect of the movie was pretty good except for the way the plot was laid out towards the end of the movie. Hancock (Will Smith) means well whenever he does a hero deed but he brings new meaning to the phrase “damage control”. Dealing with his internal struggles and his poor external image to the very people he tries to help, leaves him in a state of loneliness and carelessness. But don’t judge this book by its cover because there is good in him, we can feel it. He just needs for people to be a little grateful and accepting and he needs some really good P.R. training. This is where the ever-optimistic P.R. specialist Ray Embrey (Jason Bateman) comes in to save the day. Will Smith does and yet another fine performance with this role. He made it his own. I’ve seen better Bateman work, but this one was okay. Charlize Theron as Mary Embrey was right on as well and it doesn’t hurt that her eyes mesmerize. Overall, it is the Hancock character that steals your attention and your heart. He is different, but he is still very human. Luckily, the performances and these characters are backed up by a script that is sharp, witty and easy to follow. The combination of cinematography and special effects also help keep the movie afloat even though they start to deteriorate towards the end. The costumes were interesting too. All this put together (the acting, the dialogue, the action and special effects) helps cover up the weaknesses in the storyline. I was really looking forward to seeing this movie. I thought it would be the surprise mega-blockbuster of the season. Not! But it is not a bad movie. It was plenty fun to watch but just not as good as I was expecting. Director Peter Berg can hold his head high with this work even though it has its flaws. It is an adequate follow up to his last work, one of my personal favorites, The Kingdom. Yeah, okay, so I might be a little biased, you caught me. Regardless, add this one to your summer movie queue. just do whatever he want. no much special effect as well. Ehm.. i think this is not a great film when compare with other summer season movie. funny i thought it was horrible.